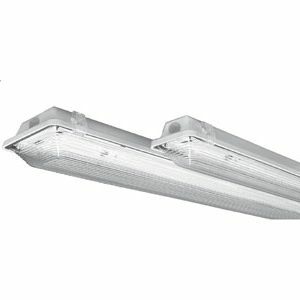 The VPVT Molded Vapor Tight Luminaire is available in 2’, 4’, and 8’ lengths, 1, 2 and 3 lamp T8, T5, T5HO and LED configurations. The weather-resistant housing is ideal for parking garages, food processing areas, refrigerated storage, marinas, or any area where moisture protection is required. Internal gear tray replaces traditional strip fixture insert, reducing both weight and expense. Poured-in-place gasket and latches seal the enclosures from most hostile environments. Polycarbonate or stainless steel and tamperproof latches available. Optional stainless steel snap-in mounting brackets reduce installation time and eliminate mounting holes in fixture body. For individual or continuous rows with optional watertight hubs. Optional specular aluminum wide distribution reflector available. Heavy-duty unsaturated fiberglass reinforced polyester housing with poured in place gasketing. Flame class V-0, 5VA. Energy-saving electronic ballasts comply with Federal Energy Efficiency standards. Ballasts are <10% THD and include 5 year manufacturer’s warranty. Ballasts operate on 120V-277V (UNV) unless specified otherwise. Ribbed diffuser is molded of UV stabilized acrylic/DR blend to resist breakage and maintain flexibility. Optional polycarbonate lens available in 2’ and 4’ only. Water clear lens is also available. Single lamp narrow unit is standard with a polycarbonate lens.